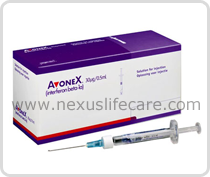 Uses:- Avonex Injection (interferon beta-1a) is made from human proteins. Interferons help the body fight viral infections.Avonex Injection is used to treat relapsing multiple sclerosis (MS). Avonex Injection will not cure MS, it will only decrease the frequency of relapse symptoms.